Today, I went for a walk around the neighbourhood. There was a bit of fresh snow on the ground and it wasn’t too cold for once in Calgary! This is the alley outside my house. 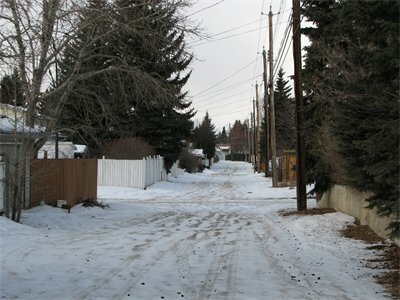 The residential roads are all covered with thick, tightly packed ice and snow! In this view, you can imagine how every part of the alley would look the same at night, which is what I discovered the hard way. Having any type of fun at this elementary school isn’t allowed. 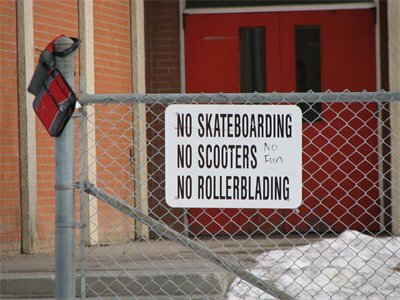 I wonder if any kids named Scooter ever got bullied and kicked off school grounds because of this sign. 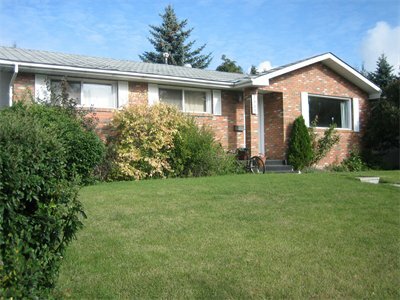 A very nice house without an accessible garage. Either snow birds live here, or they just never use a car. You can’t see it clearly in this picture, but there’s also a front gate before you get to the front door. It must really be an ordeal to leave and come back to this place. This environmental park I walked through is very nice, though the effect of the “natural environmental” part is contradicted somewhat by the large power towers in the background. Another shot from the environmental park. Those garages must be the natural habitat for wild, undomesticated trucks and cars. I kid you a little with the pictures above. This park actually has a nice view of the river and lengthy walking trails with benches. Not too far off in the distance, you can see the mountains. This is a big city, but nature isn’t too far away either. School has been real busy, so I haven’t had much time to update my blog. I have some pictures to share, taken unfortunately with my smaller camera where the quality isn’t as good. 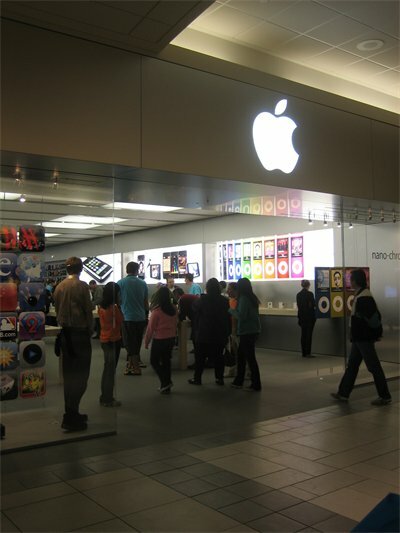 Last Saturday saw the opening of a new Apple Store, just 15 minutes down the road from me in Market Mall. 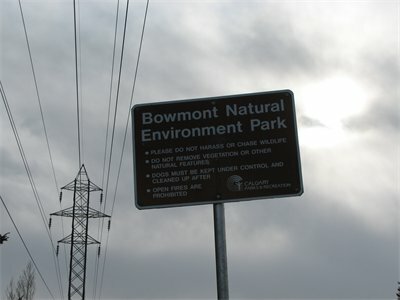 This is one of only a few locations in all of Canada, and the only one in Calgary. The first thing I may buy here is a new iPod nano. I haven’t decided yet! A few days ago, I had some free time, so I explored a park near my house. Beautiful autumn colours are visible everywhere. This shot came out a bit too bright, but there’s a new building going up in the distance where it’s all white. It’s going to be an office building for Smart Technologies, makers of the SmartBoards! 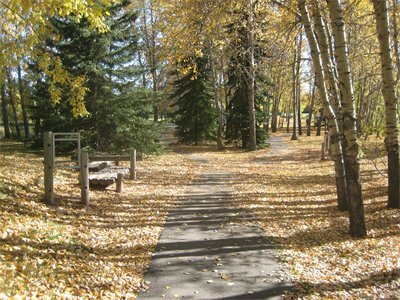 Leaves cover virtually everything everywhere this time of year. In other news, I finally bought a Nintendo Wii last week, with Mario Kart. I’m usually not a huge video game person, but I like Mario Kart so far! That’s all for now! Hopefully I’ll have time to add more blog posts soon. 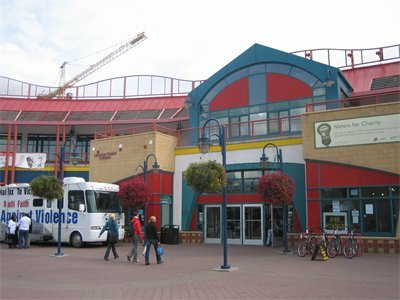 Eea Claire Market is a colourful, trendy downtown mall, and the focal point of the Eau Clair area in which it sits. Eau Clair also contains the city’s festival district. 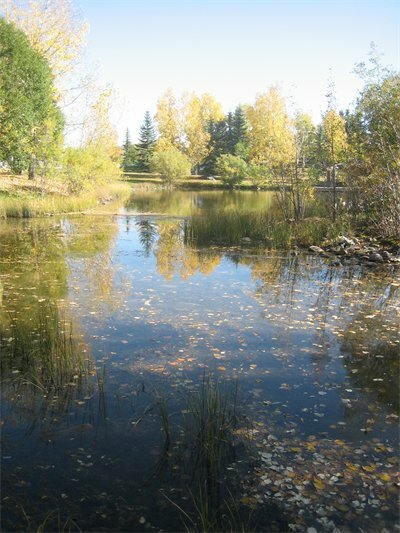 The land itself was originally used for industrial purposes starting back in the 1880’s by the Eau Clair Lumber Mill. 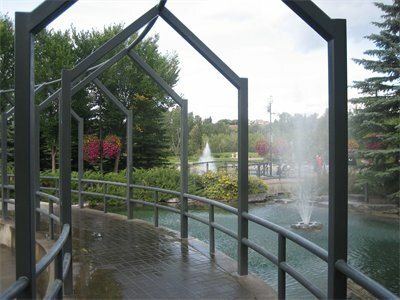 This is beautiful Prince’s Island Park near Eua Claire Market and not far from the riverfront. 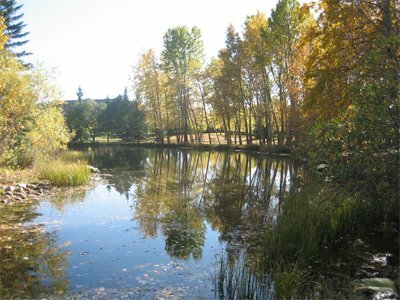 The park takes its name from the founder of the Eau Clair Lumber Mill. 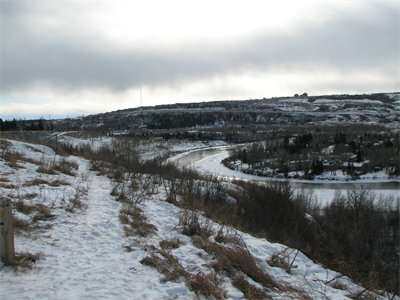 The land was donated to the city in 1947 by the Prince family. 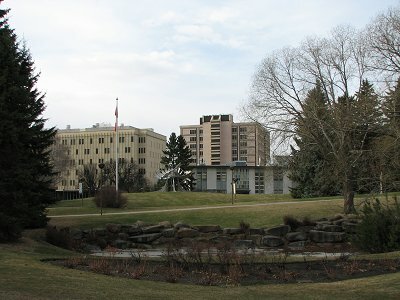 Another view of Prince’s Island Park. This bridge sometimes get you wet when you walk on it! 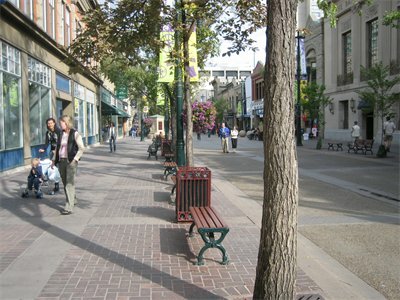 Stephen Avenue, a pedestrian only street during the day! The avenue sits next to the city’s primary indoor shopping complexes. Many historic buildings are concentrated on this street, which itself was declared a Canadian historic site in 1992. Following a major fire in 1886 that damaged much of the city (Saint Johners, sound familiar? 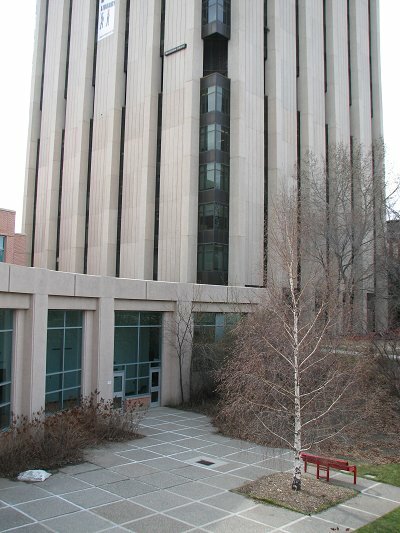 ), most of the new buildings were constructed using sandstone. 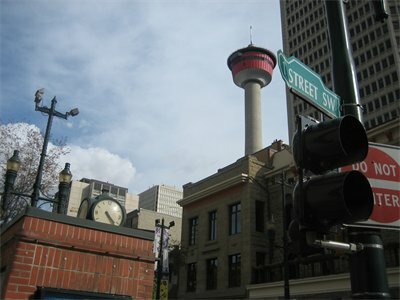 In this shot, you can see the Calgary Tower, skyscrapers, elegant lamp poles and classy buildings all together. 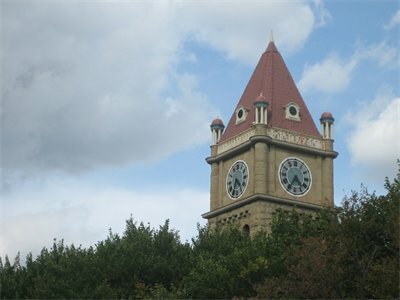 A clock tower rises above the trees, not far from Olympic Plaza. 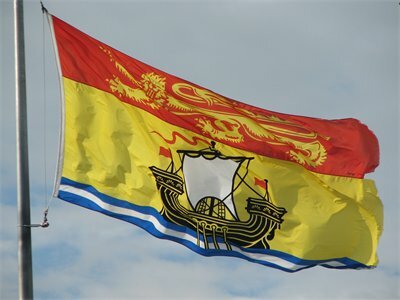 Here’s something that I had never seen before, coming from Saint John. 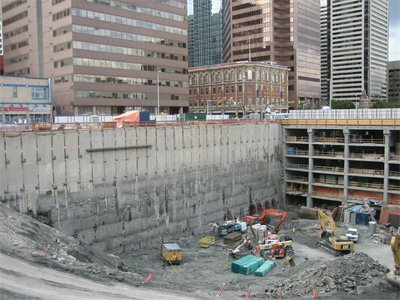 Look the size of this huge pit in the downtown! A new building is going up, and the construction equipment looks so tiny compared to everything else. The 4 storey building off in the distance, a little large by Saint John standards could fit many times into the hole! 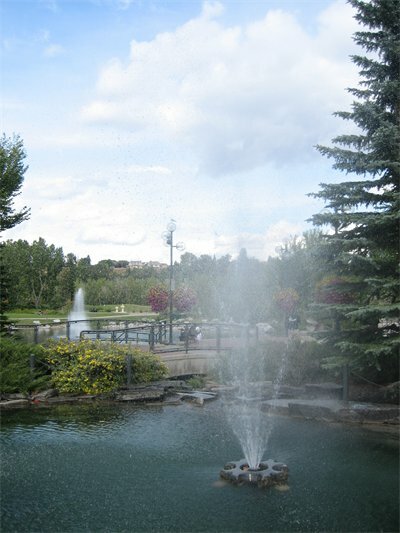 Of course, there is plenty more to see in Calgary, so I will try to keep updating my blog when I have time. A week ago today, I arrived in my new home, embarking on a new adventure. Life so far in Western Canada has its differences from New Brunswick. I took this picture at the airport before leaving since it would be several months before I’d see this flag outside again. The flight was uneventful, which is a good thing when flying for sure! My supervisor at school, Ehud, met me at the airport and helped me carry my luggage to his van outside. Considering this was all at 11:30 PM on a weekend night, this was very generous of him! He drove me to my apartment in Calgary’s Northwest where I met my landlord who showed me around my place for the first time, and went over the usual rent forms, etc. I’m living in the basement of a nice house in a beautiful neighbourhood. You already would’ve seen some interior shots in my last post. To my pleasant surprise, I am conveniently located within walking distance of two major malls in addition to school. The neighbourhood is very green with trees everywhere. 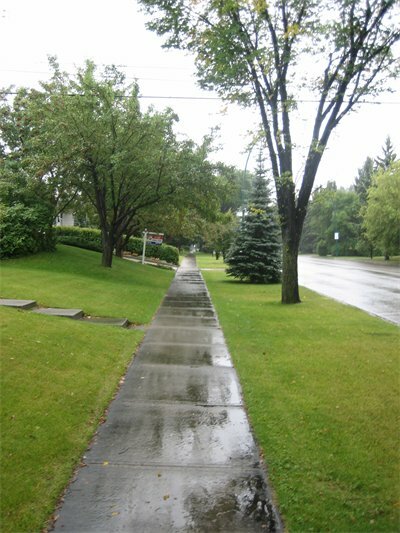 In fact, the trees are rather low on the sidewalk so I brush against them when walking. Some houses in this “rich” neighbourhood are very similar to the types you’d see in Saint John in “normal” wealth areas, but the landscaping and greenery here adds extra distinction. 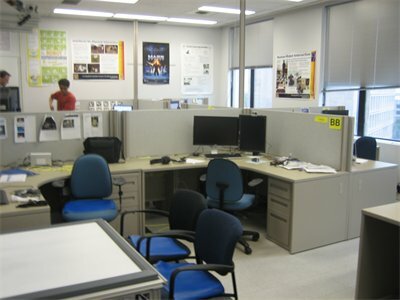 This is part of the Interactions Lab at school where I am situated. On a quick glance, this may look more like a lounge area rather than a place of academia. However, there is lots of technology here that is use for robotics and various forms of human computer interaction. To the left, you see part of a large touch-screen table, a tablet PC, as well as cameras to the right. Here is another part of the lab where us students are actually seated (actually I’m in another corner, not the one pictured here). In the bottom left, you see a large touch panel which is linked with the chairs to do certain things only when two people are seated in them. With the first week behind me, I’ve already met many new people, and seen a little bit of Calgary. I am continuing to buy new things gradually for my apartment. Orientation at school was yesterday. I think my “classes” and actual school work start to begin next week. I say classes in quotations because the two classes I will be doing are with faculty also located in the lab, and the class sizes will be extremely small. I hope to keep updating my blog and take more pictures. I haven’t taken that many unfortunately since I’ve been so busy. I hope that you will keep in touch and don’t hesitate to leave a comment on this blog! 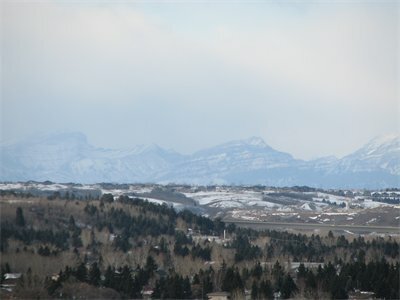 As many who know me are already aware, I am moving to Calgary in a few days to pursue my Masters in Computer Science at the University of Calgary. 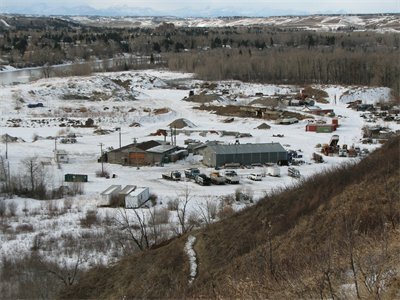 You may recall my posts a few months ago about my trip to Alberta to tour the campus. The campus land’s footprint isn’t extremely huge, but the buildings, most of them high rises, are much larger than at either UNB campus. I decided that I wanted to pursue my Masters at another school because I’m ready for a change and a new experience. The UofC campus seems nice enough. With over 25,000 students, the university has many services and amenities to offer. Due to my somewhat late application, I was not able to obtain a spot in residence. Years of explosive growth in Calgary have apparently left the UofC with a less residence space to student ratio than other universities. 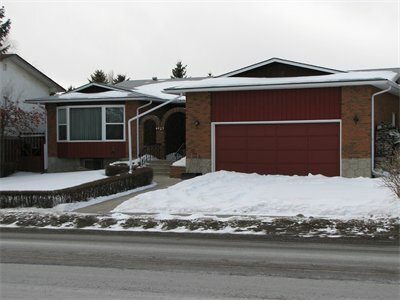 So, I am going to be a renting a 2 bedroom basement apartment (or suite as they tend to be called in Calgary) not far away from campus. Presently, I don’t have a roommate, but I could have one in the future if I want. As you can see, it’s a nice place! It’s not furnished, though there is a bit of furniture the landlord is graciously supplying anyway. 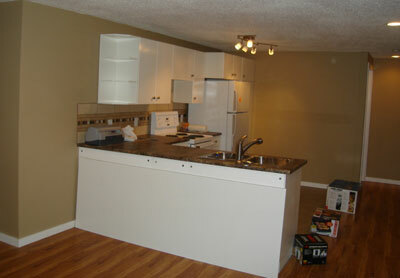 These pictures were taken by the landlord, not me. 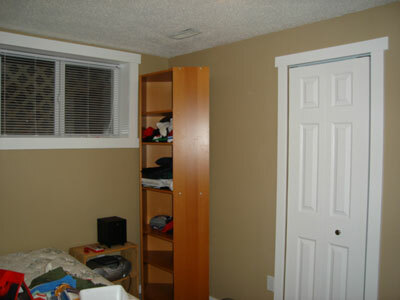 Here is another room. It looks very clean and freshly done over. Although a 2-bedroom is more space than I need, it’s an added benefit since there was some 1-bedroom suites closer to campus for the same price, in tall high rises that would require elevator access! As you can imagine, pretty much everything is about to change for me within the next week. On Friday, I’ll be leaving my position with Innovatia, where I have been employed since summer 2003. On Saturday, I fly out to Calgary. Stay tuned, as I hope to post more updates in the next few days and weeks.